six + three = Required Please enter the correct value. The Bank of Japan (BoJ) rattled global markets Friday by announcing its adoption of a negative-interest-rate policy intended to spur banks to lend and consumers to spend. The world's third-largest economy, then, joins a handful of European countries who are experimenting with less-than-zero rates, among them Denmark, Austria, Switzerland, and Sweden, which I've written about previously. The BoJ's move is just the latest to suggest that global central banks' bag of tricks to stimulate growth is quickly running empty, and that the imbalance between monetary and fiscal policies continues to accelerate. Negative rates charge banks for parking excess cash and ultimately punish savers, yet make gold more attractive. Already companies and individuals are more indebted than ever before. Bloomberg reports that corporate leveraging around the world has reached an unprecedented, and arresting, $29 trillion. In 2015, debt reached three times earnings before interest, taxes, depreciation, and amortization, a 12-year record. An estimated one-third of these companies, meanwhile, are unable to generate enough returns on investment to cover the cost of credit. If this is a debt bubble, it only adds to speculation that we're headed for a global recession. As I mentioned recently, several prominent voices, including George Soros and Marc Faber, believe recessionary forces are growing stronger, precipitated by struggling commodity prices and surging global debt. It might be hard to remember after a nearly seven-year equity bull market, but we've been here before. 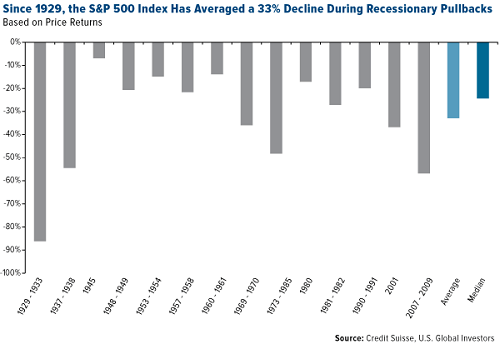 Credit Suisse looked at 14 recessionary pullbacks between 1929 and 2008 and found that the S&P 500 Index, after lasting an average 298 trading days, declined an average 33%. Some of these recessions, obviously, lasted longer and were more severe than others, such as the most recent one that lasted between 2007 and 2009. But each of these pullbacks, Credit Suisse notes, provided ample buying opportunities in U.S. stocks. Rebounds following the recessions averaged 62% – up to 80% following the 2007 financial crisis. Whether or not a recession is imminent, I believe it's a good idea for investors to be prepared. That means having a well-diversified portfolio, including assets such as gold and municipal bonds. Gold has tended to have a low correlation with stocks, meaning that even when stocks were tumbling, it's managed to retain its value well. The same can be said for short-term, high-quality munis, which have been shown to offer a greater amount of stability than some other types of securities, even during market downturns. In 2015, munis, as represented by the Barclays Municipal Bond Index, were actually the top fixed-income asset class, beating both Treasuries and corporate debt. They also outperformed S&P 500 Index stocks, returning more than double what stocks delivered. Muni fund inflows gained momentum in the second half of 2015 as global stock markets began to show signs of trouble, and so far this year, investors are piling into munis at a rate of about $1 billion per week. The last couple of decades were among the most volatile, with the tech bubble and financial crisis challenging markets. Out of more than 31,000 equity and bond funds during this 21-year period, only 0.12% of the total number, made up almost completely of municipal and short-term bond funds, managed to deliver positive returns on a consistent basis. 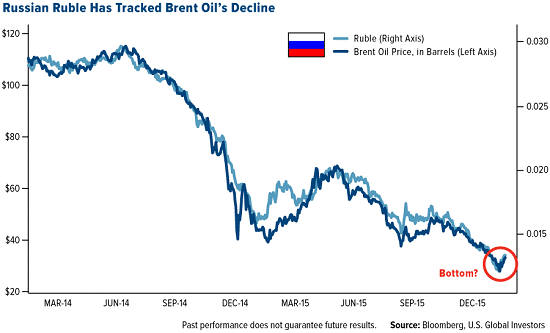 Several forecasts last week suggest oil prices are unlikely to recover in 2016 – and might fall even further. Morgan Stanley says crude could reach $20 per barrel as the U.S. dollar continues to strengthen. The U.S. Energy Information Administration (EIA) predicts that we might not see supply and demand start to rebalance and prices recover until late 2017. And the World Bank lowered its 2016 forecast for crude oil prices, from $51 per barrel on average to $37 per barrel. The downward revision is based on a number of factors, including sooner than expected oil exports from Iran, a mild winter in the Northern Hemisphere and, most significantly, continued imbalance between global supply and demand. U.S. producers have been much more resilient than expected to lower oil prices. But talk that meaningful production cuts are on the horizon led oil higher last week, helping it achieve its first three-day winning streak of the new year. In the global production staring contest, it appears as if Russia blinked first, as it just expressed an interest in reaching terms with the Organization of Petroleum Exporting Countries (OPEC) on output cuts. Like Saudi Arabia, Nigeria, Iraq, and Venezuela, Russia greatly depends on oil exports, the revenue from which makes up about half of its government's total revenue. The country averaged 10.5 million barrels a day in 2014, making it the world's third-largest oil producer after the United States and Saudi Arabia. Coupled with Western sanctions for its involvement in Ukraine, low prices have wreaked havoc on Russia's economy, which contracted 3.7% in 2015 and is expected to fall another 1% this year. The ruble, which closely tracks the decline in Brent oil, has lost approximately half its value against the U.S. dollar in the last two years. Reaching a production cap deal with OPEC, whose members are collectively responsible for about 40% of the world's output, would help rebalance supply and demand and firm up prices. Oil has historically bottomed in the month of January, and it appears that we finally found a bottom. It remains under pressure, but we could see oil climb to between $38 and $40 per barrel over the next three months. In the longer term, things look more constructive. Oil will continue to be the world's most important source of energy for at least the next couple of decades, according to a new report from Exxon Mobil. We should expect to see a 25% increase in energy demand by 2040, which is like adding another North and South America. 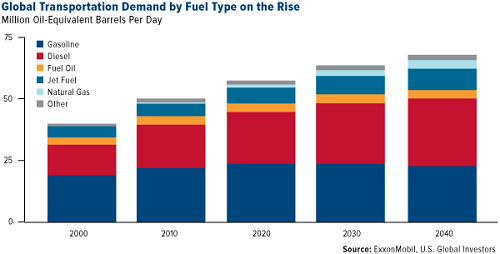 Looking at transportation fuels, natural gas demand is expected to grow the most – 300% between 2014 and 2040. Jet fuel should climb 55% as air travel demand increases in emerging and developing markets. By 2040, the world population should surge to 9 billion, with a greater percentage of people than ever before demanding affordable, reliable energy for their homes and businesses. 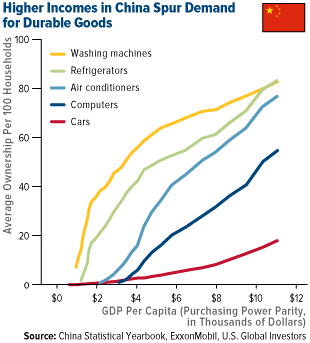 Even though its demand for materials and commodities has cooled in the last year, China should continue to see huge consumption growth in durable goods for many years to come as its GDP per capita expands. Back in October, Credit Suisse reported that the size of China's middle class had, for the first time, overtaken the size of the American middle class, 109 million adults compared to 92 million. As this group increases in number, so too rises the demand for durable goods, vehicles, energy, and other things we expect to find in a middle-class lifestyle. In a report last week, McKinsey & Co.'s Gordon Orr urges readers to focus on the absolute scale of China's economy, not just slowing growth. "No matter what rate the country grows at in 2016," Orr writes, "its share of the global economy and of many specific sectors will be larger than ever." For forward-looking global investors, that's optimistic news indeed. [Editor's Note: Frank Holmes is chief executive officer and chief investment officer of U.S. Global Investors Inc., which manages a diversified family of mutual funds and hedge funds specializing in natural resources, emerging markets, and infrastructure. He has been profiled by Fortune, Barron's, Financial Times, and other publications. If you want commentary and analysis from Holmes and the rest of the U.S. Global Investors team delivered to your inbox every Friday, sign up to receive the weekly Investor Alert at www.usfunds.com. U.S. Global Investors Inc. is an investment adviser registered with the Securities and Exchange Commission ("SEC"). This does not mean that we are sponsored, recommended, or approved by the SEC, or that our abilities or qualifications in any respect have been passed upon by the SEC or any officer of the SEC. You mention purchasing gold and munis to help during a depression. What percentage of a portfolio would you suggest and what other investments by percentage would be advisable?